Pictured at the conferrings at NUI Galway, from left: Charlie Byrne, president of NUI Galway, Dr Jim Browne, and Patricia Burke Brogan. Three leading figures in literature, music, education, and the arts have received honorary degrees from NUI Galway this week in recognition of their contribution to the arts in Galway. Carl Hession, Charlie Byrne, and Patricia Burke Brogan were honoured during the university’s graduation ceremonies, which have been taking place throughout the week. Carl Hession, who has been involved in music in Galway for the past 30 years, primarily though his work at Coláiste Iognáid, received an honorary Master’s of Music. Mr Hession’s association with and contribution to the school’s annual show and other events as composer and musical director are also highly regarded. He has designed and taught the music methodology on NUI Galway’s professional diploma in education programme, and through his work in recent years as musical director for the university’s medical orchestra, he has helped rekindle and support the development of students’ musical talents, and to promote music engagement among students in the School of Medicine. His composition Rhythm of the Dance and his most recent involvement with the Moscow Ballet are testament to his dedication and talent as a composer. 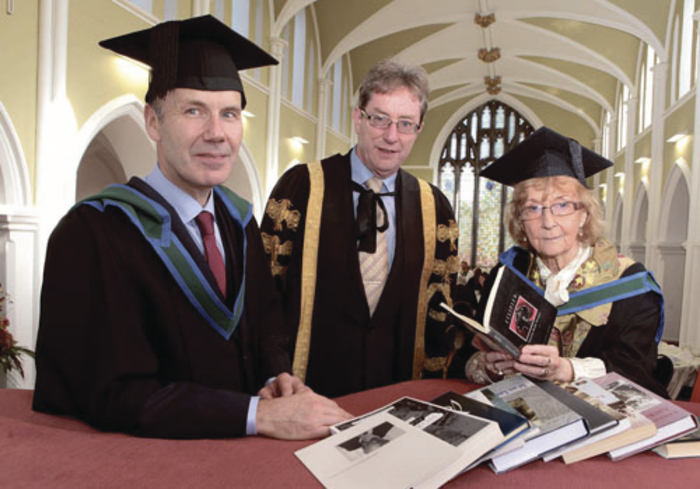 Charlie Byrne, founder and owner of Charlie Byrne’s Bookshop, received an honorary Master’s of Arts during the week. Charlie Byrne’s opened in 1988 as a market stall, and has grown over the years to become one of Ireland’s most successful bookshops. The business has become a cultural venue in Galway city, hosting book launches, readings, signings, poetry slams, musical evenings, art exhibitions, and book clubs, and in 2013 it received The Irish Times Bookshop of the Year Award. A native of Longford, Charlie Byrne graduated from NUI Galway with a Bachelor of Arts in 1981. Internationally renowned poet, playwright, and painter Patricia Burke Brogan was also conferred with an honorary Master’s of Arts. Born in Co Clare and now living in Galway city, Ms Burke Brogan’s paintings and graphics have been exhibited widely, both nationally and internationally, she has won many awards for her plays, poems, graphics, and short stories. Her stage play Eclipsed, first produced in 1992, was presented with a Fringe First at the Edinburgh Theatre Festival that year and has since been produced all over the world and been translated into many languages, including Japanese for a recent production in Tokyo. Her memoir was published earlier this year. Some 3,000 students graduated from the university during the autumn conferring ceremonies.